Gabe Logan goes undercover to infiltrate a terrorist conspiracy in Syphon Filter: Dark Mirror, a finely crafted stealth action title for the PSP. While slightly scaled-down, the handheld version promises to bring everything players love about the series to the system. An engaging storyline and supporting characters creates an immersive experience with robust production values. Dark Mirror's sophisticated AI, excellent level design, and story make for an intense game clearly aimed at adults, not children. You have gadgets such as tear gas, sniper rifles, and slick goggles to enhance vision at your disposal. Read on and find out why Dark Mirror's polished appearance, great controls, and a solid storyline make this an excellent title that brings the danger and excitement of stealth action into the palm of your hand. It would be easy to dismiss Syphon Filter: Dark Mirror as just another watered down console port, but the game is surprisingly deep and challenging, with an engrossing storyline and play that keeps you engaged throughout the 30 or so missions included. The game is set in the near future, where a clandestine government agency is assigned sensitive missions that are too sensitive for military and difficult for civilian forces. An opening cinema introduces players to secret operative Gabe Logan and his specialists as they find themselves trying to discover what's going on at an isolated refinery in Alaska. While the mission seems straightforward on the surface, many hidden agendas and forces come to the surface as the game progresses. During the game, players will uncover many secrets, including a woman from Gabe's past who has knowledge of Project Dark Mirror, a weapon of mass destruction. It is up to you to find this mysterious woman and stop her before she can wreak havoc on the world. 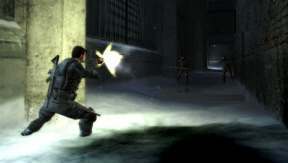 Players who enjoyed previous Syphon Filter games will be pleased to discover that Dark Mirror's tension-packed gameplay stays true to the previous games in the series. It offers a solidly entertaining mix of espionage and action, with tons of cool weapons and gadgets, and a structure that requires use of stealth, recon and, action in order to complete your missions. You aren't working alone, and you'll need to communicate with some of the other clandestine agents throughout the game for information and objectives. You also need to help them out by unlocking secret items and performing other tasks. During one mission, Gabe has to provide cover fire for another agent running below his position high atop a tower. Since the player can see the enemies and the other agent is in the dark, it's up to you to guide them along. You can order them to stay in position until they can safely travel when an area is cleared of all dangers. This adds a new dimension to the missions. These secondary characters are believable and interesting enough to make the storyline more credible and layered. Dark Mirror's missions consist of different objectives you need to complete, such as acquiring a document, securing an enemy base, or rescuing hostages. Your missions can be quite fluid and your objectives can change as events affect your missions. Gabe has a basic set of weapons and abilities at the start of the game, which he uses throughout his adventures. In order to help you become aware of your surroundings, you can use your on-screen radar to locate guards, since each levels is crawling with enemies. Avoiding detection is the key in most areas, but Gabe can also dispatch them with weapons or hand-to-hand combat at close range. It's usually better to attack foes from afar, since they are less likely to inflict damage. At close range, they can deplete your life much faster, and call in others, further hurting your chances. One of the most important skills at your disposal is stealth. Logan can stand against an object such as a post or a wall and use the d-pad to peek around corners and create a safe angle to take out enemies without alerting other nearby guards. Using this technique effectively is also important because it keeps the other soldiers off-guard, making him less vulnerable at the same time. Each mission progresses rapidly, and there are a number of checkpoints that help you progress through Dark Mirror's levels without excessive backtracking. There are a number of weapons at his disposal including pistols, shotguns and sniper rifles, which you can select by calling up the weapon select HUD by pressing right on the d-pad. You equip a weapon by selecting it, and then use it in the field. You can also call up a menu that allows you to modify your weapons as well, which works by combining parts, such as silencers with your main weapons. This is a simple system, and the HUD is well designed, making it easy to understand. Using the goggles and flashlight works similarly, and this consistent approach allows you to concentrate on the action without the interface impeding the action. When you want to clear out enemies quickly, a standard pistol or shotgun makes this happen. The sniper rifles are best used when he wants to off an opponent without drawing attention to himself, or alerting other nearby guards. In addition to the standard weapons, Gabe can use a number of infrared, heat-sensitive and night vision goggles to ferret out the location of enemies. This is particularly useful when scooping enemies from afar, you can toggle these visual aids depending on the situation. Using the HUD, players can use the sniper scope in combination with one of the goggles to locate an enemy, zoom in to their position, and take them out quickly and effectively. This system is implemented surprisingly effectively with the buttons intelligently and intuitively mapped out. There's quite an arsenal at your disposal, but you can also use his bare hands to battle foes at close range, using his gun itself as a weapon. He can also shoot poison gas, place tactical explosives, and tranquilizer darts at any opponents that he encounters. Dark Mirror offers some surprisingly stiff opposition to your team mates, with some very sophisticated AI used to make enemies much smarter than you'd assume. Most of the enemies are a bit smarter than you'd think, and will call in reinforcements to your position if they locate you, that make it imperative to take them down quickly and quietly. Dark Mirror's gameplay is straightforward for the most part, though there are some interesting features that increase your interaction with the other characters, allowing you to play cooperatively with other characters, which adds to the immersion. Adding to the game's cinematic feel are the richly developed production values, which give depth to the characters and storyline. Dark Mirror's levels look fantastic with detailed texture mapping and realistic lighting lending the game a realistic appearance. Dark Mirror's impressive environmental effects such as snow and fire increase the realism and heighten its foreboding atmosphere. The game runs at a smooth frame rate throughout, though some of the camera work seems a little choppy at points. The game's overall look is impressive with natural looking characters and rag-doll physics used to heighten the realism. An extensive orchestrated score adds drama to the proceedings. The voice acting looks surprisingly good, bringing the story to life effectively. Surprisingly, even the guards have plenty of dialogue, which is important because they drop clues when they talk to each other. 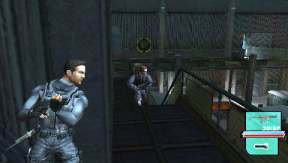 The single player missions are superb, but Syphon Filter also includes a number of multiplayer modes using Wi-fi connections and infrastructure mode. There are four distinct gameplay variations including Rogue Agent, Deathmatch, Team Deathmatch, and Objective modes. Rogue Agent mode is the most interesting part of the online mode, where all the players start on the same team, but one can become the Rogue, which then gives him special abilities that let them take out their former team members. The objective here is to be the first to reach the object, while escaping the Rogue as long as possible if you don't. Objective modes play like the solo game, with players working co-operatively to reach objectives and items, while the Deathmatch and Team Deathmatch modes should be fairly self-explanatory. Setting up the games was relatively painless, with a slimmed down lobby system allowing you to create variations and rules before hand. During play, the action was smooth and well done with little in the way of lag or slowdown. Dark Mirrors online mode is able to support up to eight simultaneous players online using Infrastructure mode, making for an excellent addition to an already exciting game. 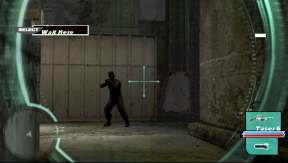 From an aesthetic standpoint, Syphon Filter's structure and gameplay have translated faithfully to the PSP for the most part. Unfortunately, one area that may cause problems are the graphics, which seem a bit too dark for the PSP screen. This makes objects blur together, mixing the foreground and backgrounds frequently. You can adjust the contrast and brightness in the options screen, but Dark Mirror than loses atmosphere. The overall feel of the game is also a bit choppy at points, which may point to the difficulty in implementing this type of game on a handheld. Fortunately, one area where the game could have fallen down but doesn't are the controls. The default settings work nicely with the analog stick used for movement, while the left face buttons are used to look around and strafe. This is remarkably effective and intuitive, making the game easy to play. It's a straightforward approach and becomes second nature quickly. Dark Mirror's controls work well but players can select from several other button configuration, including a traditional mode that includes auto-targeting which makes the game easier. As you progress through the game, it becomes apparent that this is more than just another point and shoot FPS, the storyline is surprisingly rich and fleshed out nicely throughout, with plots unfolding at a good clip throughout. The solo campaign is highly tuned, making the gameplay challenging and exciting while never overly frustrating. Adding to its highly polished single player mode, the online mode makes it a much deeper and more enjoyable title than you'd expect it to be. It's engaging and interesting storyline holds your interest for quite some time, making it a robust and challenging stealth action title with a surprising amount of depth and sophistication. 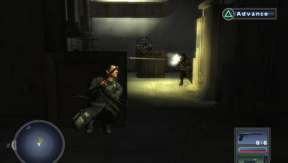 Syphon Filter: Dark Mirror is an excellent game that displays polish, challenge, and intelligence throughout, making it a satisfying and sophisticated experience for the PSP.